Journalism Tips: 1. 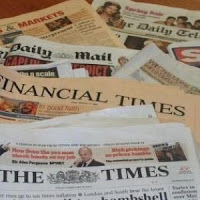 Read a national newspaper at LEAST twice a week – and not just the Guardian or Independent. Try the Mail and Sun as well. 1. Read a national newspaper at LEAST twice a week – and not just the Guardian or Independent. Try the Mail and Sun as well. Quite why this has to be stated is beyond me…the fact that it does says a lot about some of the competition (or lack of it) that trainee journalists face. In other words not a lot. Indeed some have criticised journalismtips for being patronising - oh but I wish it was. I decided it needed stating after talking to a second year - yes, a second year - journalism student. Having read the first draft of her copy - about a woman celebrating her 100th birthday - I asked her to re-write it into something that resembled newspaper copy. Five drafts later and I wanted to know what newspaper she read. Her reply was actually more shocking than her copy, "The Guardian" she said with no small amount of pompousness in her voice before adding "...occasionally." I suggested she might want to broaden her (limited) reading material to include the Daily Mail and The Sun…I may as well have asked her out on a date given the sheer revulsion that spread over her face. Oddly enough she was unable to fulfill the rest of her week long stint of work experience, which was a relief for all concerned. What she was doing in a newspaper office was beyond me…more worryingly, what they had been teaching her for the past 18 months was mystifying. But she was - is - not alone. So if you want to work in the media (any type of media not just in print) you should be reading national newspapers and not just The Guardian. To do so is media equivalent of a dietitian only studying the nutritional make-up of muesli and no other foodstuffs on the grounds it is good for you. Yes, it might well be but a mixed diet is healthy and can be fun too. I say a couple of times a week - I actually mean seven days a week. That's right every day - even at weekends. But, for the sake of form, twice is at least a start. And please feel free to read the Guardian but make sure you include the Mail and the Sun and the Mirror and the Express and the Times and the Telegraph and the Independent. At £3 a pop you can skip the Financial Times (although it has a very good magazine at the weekend) unless you want to go into financial journalism. You should be getting a feel for what makes news and the way to do that is by reading an actual newspaper. Don't rely on the internet that will only draw you to a few articles you are interested in. So yes, buy the newspaper. As a journo of fifteen years experience i would recommend a good news magazine too. My favourite is Vanity Fair. Some of the best writing in America. Indeed you're right…but as you can see I am starting off from a very basic level. Personally I read The Economist, The Spectator, Private Eye and occasionally Time. But let's just get them reading newspapers first before throwing fancy ideas into the mix.